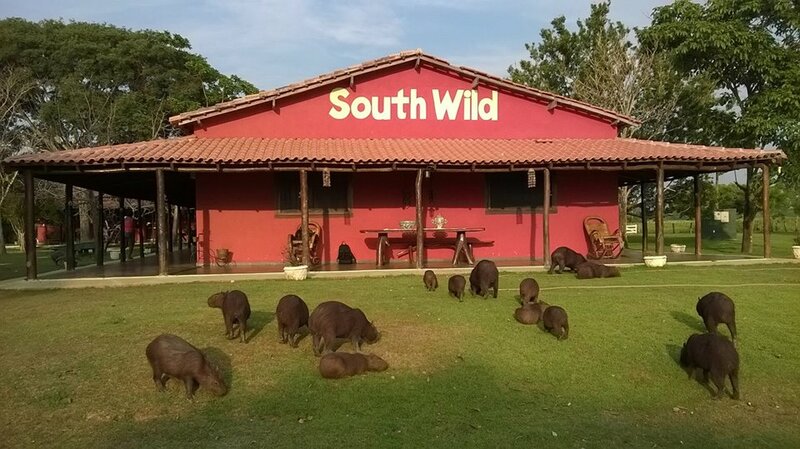 The SouthWild Pantanal Lodge is located 2.5 km off the Transpantaneira Road, on the forested banks of the wildlife-rich Pixaim River. 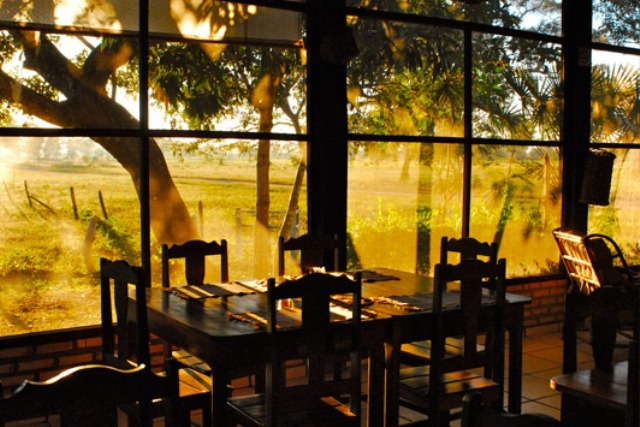 With air conditioned rooms and accessible riverine forest, SWP offers the Pantanal’s best value for serious birders, naturalists, and photographers. They offer boat outings that feature the world’s tamest Giant Otters. Other exclusives are the Pantanal’s only mobile canopy towers strategically located at fruiting and flowering trees and silent, electric river catamarans for photographers using long lenses on tripods. 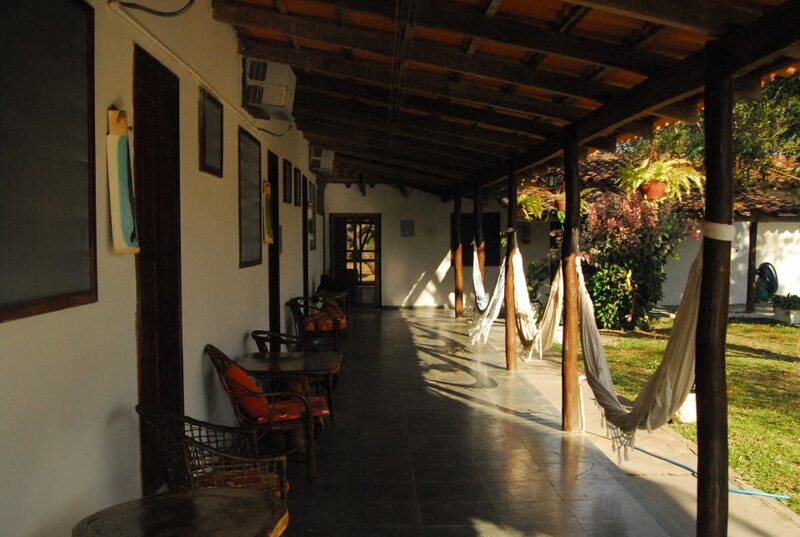 SWP also offers horse rides, cattle drives, walks on scientifically-designed forest trails, research lectures, mammal spotlighting, star chart for study of the spectacular night sky, and Brazilian barbecues. 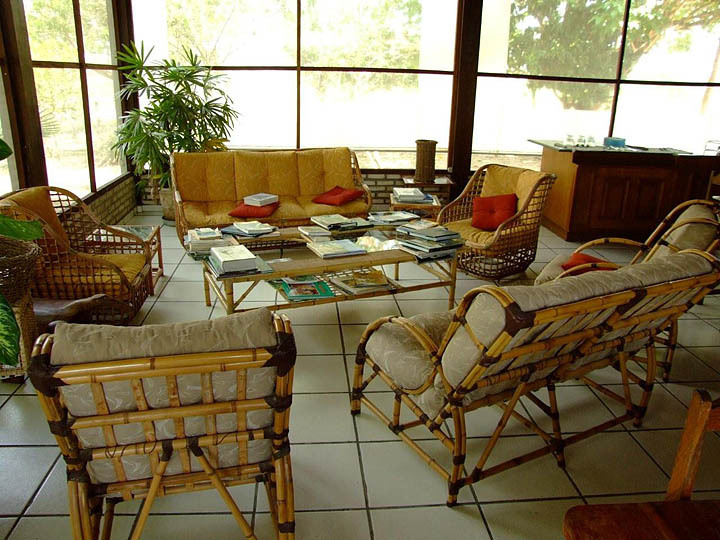 The lodge consists of one large, fully-screened living room/dining room with many overhead fans, outdoor sitting areas, and a library on Brazilian nature. Each of our twelve screened guest rooms has private bathroom with hot showers, overhead fans, air conditioning and one queen or two twin beds. To eliminate plastic bottle waste, the lodge now offers complimentary, chilled drinking water dispensed in unlimited amounts from dedicated water coolers. Bring your own durable Nalgene bottle to refill. 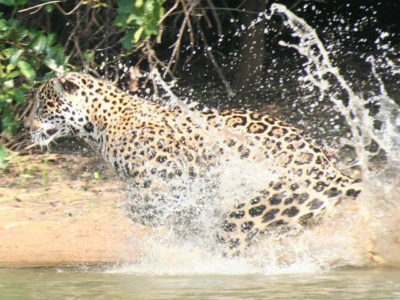 The SouthWild Pantanal Lodge is constantly improving both the quantity and quality of the amazing wildlife sightings. You will access field, forest, and river variously with horseback riding, boat outings, trail walks, mobile observation towers, electric photo catamarans, and night spotlighting from our dedicated truck with special photo logistics. 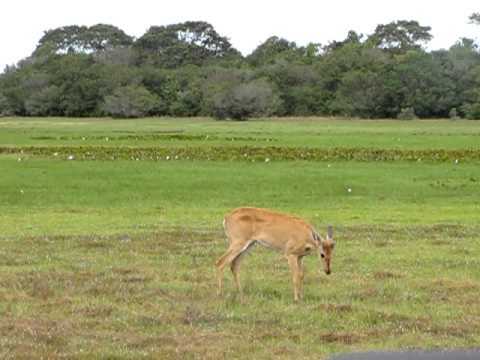 The last three are unique to our lodges -- no other lodge in the Pantanal offers them. 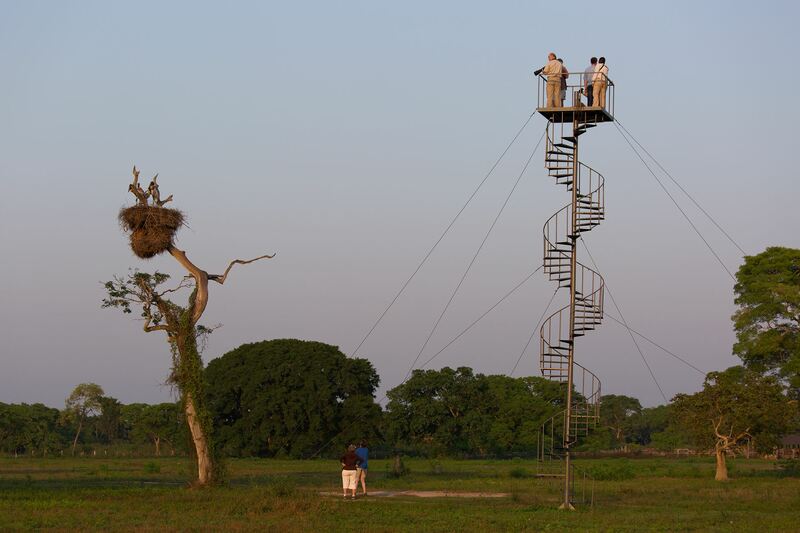 Surprisingly, the lodge has the world's only observation tower at a Jabiru Stork nest. This 12-meter-tall platform is accessed by a user-friendly spiral staircase. The top of the tower is at the level of the nest, which is only 15 meters away. Our specially-trained naturalists have habituated these storks for years so that the birds now completely ignore guests and carry out all their most intimate nesting behavior in full view. The 10 very calm, experienced horses are ideal for exploration of otherwise-inaccessible fields, marshes, and forests in a radius of 10 km or more from the lodge. The normal duration of rides is 2 hours, but longer rides and even overnight horse expeditions to other ranches can be arranged upon request. SWP offers hard hats for extra riding safety. Ocelots appear every night (and sometimes during the day!) in front of the hide. Set up with photography in mind, the hide has plenty of tripod room, with nothing obstructing the view of the Ocelots, which regularly come within a few meters! Birders love the scientifically-designed trail system through the Pantanal’s most easily-accessible gallery or riverine forest, a bird-rich habitat that represents only 2% of the Pantanal. Furthermore, we offer a complete lodge bird list (340 species) compiled by a leading Pantanal bird guide and a Ph.D. ornithologist (one of the lodge owners). The lodge location allows easy day trips to the Campo de Jofre area 60 km south on the Transpantaneira, a must for listers/tickers. These enormous wading birds fly next to our boat and land on the banks of the river to pose in ideal, golden afternoon light, framed by lush tropical vegetation. The river also boasts Agami Herons, very tame Black-collared Hawks, Sunbitterns, Sungrebes, Bare-faced Curassows, and a profusion of other water and forest birds. 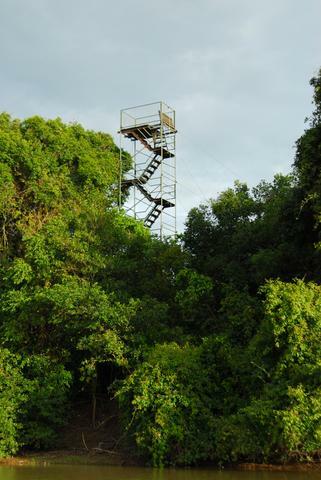 Five kilometres of well-designed trails criss cross riverine forest and drier cerrado, allowing for excellent opportunities to search for rare Pantanal birds as well for troops of Brown Capuchin Monkeys, Black and Gold Howler Monkeys, and Silvery Marmosets (energetic, squirrel-sized monkeys). The only way to view and photograph from close range all three monkeys and the long list of fruit-eating or nectar-drinking birds is to place convenient, metal observation towers within a few metres of the active fruiting or flowering trees. 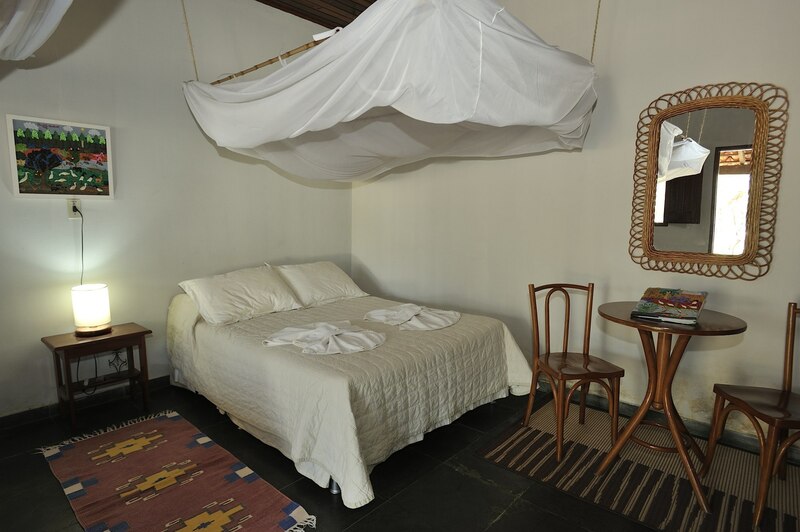 SWP is the first and only lodge in all the Pantanal to offer towers that move with the fruit and the flowers. SWP normally offers daytime viewing and photo opportunities of a Great Potoo at 7 m or less in excellent light at eye level with a background of vegetation instead of sky, which allows you to see and to photograph the birds complicated feather pattern. Finally, SWP places towers topped with hides within just a few metres of one or more Jabiru nests and nests of other spectacular birds. These nest observation towers allow unique observation angles that are ideal for still photos and video. Night spotlighting outings (in raised, open cars or small trucks) are offered (on an optional, but included, basis) on any and all nights in the Pantanal. 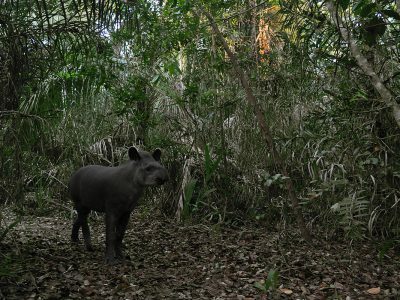 Note that these spotlighting outings might not be totally private, as our open observation trucks normally are available for any and all guests staying at our exclusive, 20-bed SWP lodge. The trucks always are spacious enough to ensure excellent wildlife viewing for all.